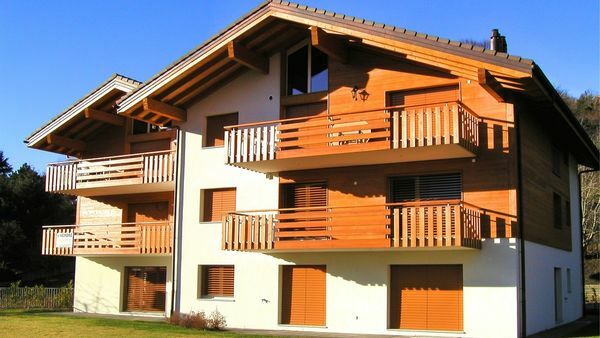 Apartments located in a new development in a village below Crans-Montana with possibility of sale to foreigners and second home, which is rare opportunity in the resort. Very quiet area with views over the whole Alpine arc and located only 10 minutes away from the ski slopes. Shops nearby a few minutes stepwalk from the residence. Apartments proposed range from studios to 5.5 rooms. All are composed of an entrance hall overlooking on a wide living room with openned kitchen, overlooking a large balcony or terrace according to the floor of the flat. Large bedrooms and bathrooms and / or shower rooms complete this property. The entire residence has been designed in a traditional architecture of quality and standards. You have the possibility to choose all finishing of your apartment. Details of appartements lots and prices on request. Average price per m2 attractive: less than CHF 6,200.- m2 !